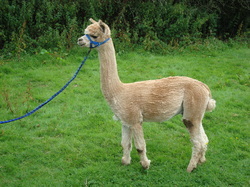 Alpacas produce fibre. 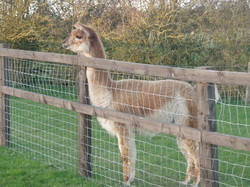 There are two alpaca breed types: Huacaya and Suri. Alpacas produce five main colours which can be subdivided into 23 natural colours, ranging from white, beige through fawn to brown and black. Alpaca fibres can be blended at the mill to produce even more colour variations and natural dyes have produced some very good results. At Old Brick Farm we breed Huacayas. Huacaya fleeces are dense with fine fibres resulting in some beautifully soft and warm processed yarn. We breed to improve our fleece quality by selecting our stud males with great care. Our aim is to produce consistent fibre across the herd which will of course take time! Finer fibre is softer to the touch and lighter, whereas coarser fibre though more durable, will cause prickliness and scratchiness in a garment. 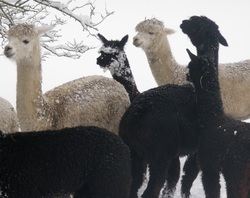 Huacaya alpacas are shorn annually and the resulting fleece is processed into garment-quality yarn. It can be utilized in either wool or worsted style yarn and even the poorer quality fibre can be used for felting, insulation, rugs and the production of dog beds, for example. A word of warning – once shorn the alpacas look very different! A Huacaya fleece should feel lovely (handle). Sometimes it is better to feel the fleece before you look at it! An absence of coarse fibres (guard hairs) is desirable as these longer and tougher fibres lead to a scratchy and prickly feel if woven into a garment. It should be bright ,in other words it should glow when you open the fleece. It should be pure in colour meaning that there should be no white fibres in a black fleece. Ideally it should also be dense.